Over the last decade, the efficacy and use of stereotactic radiation has increased dramatically because of improvements in medical imaging, computer technology, and advanced delivery devices. As a result, stereotactic radiation has become a viable and useful primary management alternative for patients with cerebellopontine angle and/or skull base tumors, including acoustic neuromas, meningiomas, and paragangliomas. In addition, stereotactic radiotherapy is increasingly used for secondary management of recurrent or residual disease (ie, in patients in whom gross tumor resection is accomplished but microscopic tumor residual is specifically left on vital structures such as cranial nerves in order to minimize risk of functional deficit). Contemporary neurotological/neurosurgical teams must have an understanding of this tool and use this information for the benefit of patients. This article is intended to be a concise resource for the neurotologist and neurosurgeon; it provides a basic introduction of the technology available, the applications in the management of acoustic neuromas (including the role of the neurotologist/ neurosurgeon in treatment planning), and the controversies regarding the use of radiation for the management of these tumors. A small acoustic neuroma within the internal auditory canal is easily observed on postgadolinium MRI. In most instances, traditional external beam radiation therapy (EBRT) is generated by a photon unit or a Cobalt-60 unit. The radiation beam is then delivered through a collimator, which shapes the beam. In traditional EBRT, the field or treatment area is defined by the size and shape of the collimator, and several portals or fields are used to direct the radiation beam to the tumor and the surrounding tissue. Some variation in beam intensity, location, angle, and shielding can be used to protect surrounding tissue, but, in general, there is significantly less treatment conformality to the target volume than in stereotactic systems. Because healthy tissues are typically more resistant to the effects of radiation, tumor cells are killed while the surrounding tissue eventually recovers. Although traditional EBRT is useful for certain tumors, in the past, results using traditional EBRT were often complicated by adverse effects associated with treatment, particularly loss of function of adjacent healthy tissues. Furthermore, some tumors were said to be resistant to radiation, often because of dose limitations of the surrounding or adjacent tissues. As a side note, meningiomas and acoustic neuromas were not treated with traditional radiation therapy because they were thought to be radiation resistant and because of their proximity to vital neurovascular structures and contact with the brain stem. Stereotactic radiotherapy is the term used to define the method of delivery of a precise dose of high-energy radiation through stereotactically directed narrow beams. Leksell formulated the term stereotactic radiosurgery for this method, and in the literature, stereotactic radiosurgery is the term used for single-dose stereotactic radiation treatment. Today, through the use of sophisticated imaging devices and 3-dimensional treatmentplanning computers, stereotactic radiotherapy allows much more specific targeting of a lesion, with significantly less radiation delivered to surrounding healthy tissues. Stereotactic radiotherapy allows dynamic beam shaping and intensity modulation, providing flexibility and optimal tumor dosing. Furthermore, specialized collimators and treatment plans have been developed for a variety of unusual and rare tumors. As a consequence, much higher doses can be delivered accurately to the tumor, resulting in greater control and cure rates and decreased complications. Stereotactic radiotherapy is the term used to define the method of delivery of a precise dose of high-energy radiation through stereotactically directed narrow beams. Leksell formulated the term stereotactic radiosurgery for this method, and in the literature, stereotactic radiosurgery is the term used for single-dose stereotactic radiation treatment. Today, with sophisticated imaging devices and 3-dimensional treatment planning computers, stereotactic radiotherapy allows much more specific targeting of a lesion, with significantly less radiation delivered to surrounding healthy tissues. Stereotactic radiotherapy allows dynamic beam shaping and intensity modulation, providing flexibility and optimal tumor dosing. Furthermore, specialized collimators and treatment plans have been developed for a variety of unusual and rare tumors. As a consequence, much higher doses can be delivered accurately to the tumor, resulting in greater control and cure rates and decreased complications. Stereotactic radiotherapy is traditionally delivered in a single dose. The single-dose protocol allows for delivery of an extremely high single fraction dose to an extremely precise target volume, owing to the submillimeter accuracy of dose delivery in the rigidly fixed gamma knife system. The neurosurgeon or neurotologist rigidly fixes the stereotactic head frame to the patient’s skull, which establishes a means of precise patient positioning for use in the reference frame coordinate system for target determination and treatment planning. The patient is imaged with the head frame attached, allowing for translation of cranial coordinates in real space to imaged coordinates in the planning space. MRI with gadolinium enhancement is the preferred imaging modality, but CT with contrast can be used in the event of patient contraindication to MRI. In addition, image merge can be used to optimize target visualization if nonregistered imaging taken previously is of higher quality than the head frame–registered imaging taken the morning of treatment. The neurosurgeon or neurotologist, in conjunction with the radiation oncologist, then defines the tumor volume based on the head frame–registered images. The treatment team, consisting of the neurosurgeon or neurotologist, radiation oncologist, and radiation physicist, work together to develop the treatment plan, consisting of a series of “shots” or volumetric doses of radiation—designated by 3-dimensional target location, collimator size, shot duration, and current radiation flux—which are integrated to give the volumetric dosing strategy in 3-dimensional space. The volumetric dosing strategy is normalized based on the prescribed dose specified at a given isodose line. For acoustic neuromas, the gamma knife treatment prescription is commonly 12-13 Gy at the 50% isodose line. The neurotologist/neurosurgeon and the radiation oncologist must also define vital or significant structures where radiation dosing should be blocked or minimized. For acoustic neuromas, this often includes significant work to shape the volumetric dosing strategy to minimize radiation dosing to the brainstem medially, cerebellum posteriorly, and cochlea and tympanic facial nerve laterally. The neurootologist/neurosurgeon works in conjunction with the radiation oncologist and radiation physicist to prescribe the appropriate treatment plan, including optimizing treated tumor volume, adjusting central and marginal tumor doses, and minimizing radiation doses to the critical anatomical structures in the periphery. The prescribed volumetric radiation dosing strategy is delivered to the patient only after final verification has ensured the accuracy of all beam angles and doses and ensures no collisions within the mechanical confines of the system. Final verification was once performed manually by the treatment team with a trial run through all specified shots but is now typically done automatically through software, particularly with the advent of advanced positioning systems such as the APC and integrated Perfexion units. After all verification and safety checks have been performed and all members of the treatment team have signed off on the treatment protocol, the patient is placed in the radiation unit, the head frame and the patient's head are secured to the head frame gantry, and the planned radiation treatment is then administered. Noninvasive fixation devices have allowed greater flexibility in treatment of acoustic neuromas, allowing not only single-treatment delivery of stereotactic radiation but hypofractionated regimens as well. Treatment plans can now be duplicated day to day with relatively good precision, allowing total prescribed dose to be delivered in a fractionated fashion for certain stereotactic systems. For acoustic neuromas, 3-5 fractions are typically administered in a hypofractionated stereotactic protocol. The main advantage of fractionation is that it allows higher total doses to be delivered to the tumor because of increased tolerance of the surrounding healthy tissues to each individual, smaller fractionated doses. That is, whereas single-dose stereotactic radiation takes advantage of the highest spatial resolution available for treatment volume, fractionated stereotactic radiation trades the relative disadvantage of theoretical inter-dose treatment volume frameshifts to take advantage of the differing radiosensitivities of healthy and surrounding tissues. Fractionated therapy can also use iterative treatment, ie, modifying the shape and intensity of the treatment plan during the course of therapy. Radiation therapy planning can be categorized, rather academically, as either beam priority or dose priority. Beam-priority therapy means that the target volume of radiation is determined first with the surrounding tissue volume planned based on prescription dose. This technique is also known as forward planning. Alternatively, dose-priority or inverse planning determines the safe dose for the surrounding healthy tissues first, and the required beam intensity and shape are then calculated to fit these parameters. A number of alternatives in noninvasive fixation devices are available, including frameless technology and masks/head immobilizers. Frameless technology uses implanted 2-mm gold fiducial markers, which are readily inserted around the head to provide a coordinate system. Image detectors use these markers and the patient's bony skeleton as a reference frame for localization. The computer updates the treatment plan based on this reference. Some systems have online continuous updating of the patient's position during the treatment. Mask systems use a meshed thermotransformable material to create an individual mask molded for each patient. The patient's head is placed in a horseshoe-shaped frame, and the forehead and maxilla are secured first with snug plastic strips. The nasal bridge is then firmly secured using the mask. Head immobilizers use vacuum-attached markers to secure the upper jaw and the occiput into a stable position. The mask system gives reproducible positioning with millimeter-order variation between sessions for a cooperative patient and less than 2-mm variation for a noncooperative patient. Although small, this potential inter-dosing frameshift of tumor volume is seen as a relative disadvantage of fractionated forms of stereotactic therapy, especially when considering that important structures such as the facial nerve and cochlea are literally within 1-2 mm of tumor margins in typical cases. Three methods can currently be used to deliver stereotactic radiation: (1) high-energy photon radiation produced by linear accelerator (LINAC) systems, (2) gamma radiation from a fixed-array of Cobalt-60 sources, and (3) heavy charged particles such as protons. All 3 systems use dose delivery based on the procedures described above, ie, stereotactic reference and positioning devices, imaging, 3-dimensional target and treatment planning, and delivery of the radiation with specialized collimators. With respect to the different types of radiation energy, each has similar and predictable effects on tumors. Proton beams provide the best control of penetration depth compared with photon or gamma radiation. LINAC systems achieve radiation targeting and rapid dose fall-off by rotating the patient and the treatment unit gantry simultaneously. Conversely, Gamma Knife units have 201 fixed Cobalt-60 sources aimed precisely at the center of the unit; collimators are placed near the treatment unit and in a collimator helmet surrounding the patient's head. Gamma units have a superior mechanical precision compared to LINAC units, but to date, this has not been demonstrated to offer a clinically meaningful advantage. Although no radiation unit is entirely comfortable, Gamma units are inherently less comfortable because of the rigid fixation of the head to the reference frame and gantry during treatment; it is this rigid fixation that imparts the high degree of precision in tumor volume treatment in such systems. Conversely, a disadvantage to fractionated stereotactic radiation using a LINAC system is that multiple patient visits are required, providing lower spatial resolution to treatment volume but allowing higher total tumor dosing. Certain terminology is used in the radiation oncology literature to denote specific target volumes for treatment. Gross tumor volume (GTV) is the term used for all known disease, including adjacent nodes, visible on pretreatment high-resolution imaging. Clinical tumor volume (CTV) is the term for GTV plus the surrounding tissue that presumably harbors microscopic disease. Planning target volume (PTV) provides a margin around CTV to allow for movement and treatment setup variation. Most radiation therapists include a small additional margin around PTV to allow for machine beam characteristics. The goals of performing stereotactic radiation are to achieve the highest probability of local tumor control with the lowest achievable incidence of adverse effects, to prolong the life of the patient, and to provide the best quality of life with as few anatomic and physiologic defects as possible. Following stereotactic radiation of an acoustic neuroma, little change in tumor characteristics or tumor volume is detected over the first 6 months. By 12 months postradiation, follow-up MRI scans often show the loss of central enhancement of the tumor, which usually indicates a favorable response. During the initial 12-18 months following irradiation, the tumor may exhibit initial swelling or edema, but this process declines over time. These patients are usually treated with supportive measures, including systemic steroid administration or ventriculoperitoneal shunting if indicated. By 2 years postirradiation, partial involution of the tumor is often noted. Stereotactic radiation can completely eradicate the tumor, but in most patients, residual enhancing tumor is noted on an MRI scan indefinitely. This residual tumor usually remains stable for long periods, and this is often reported as local control in the radiation oncology literature. Although postirradiation tumor necrosis and edema often have this characteristic appearance of peripheral enhancement with central pallor, the radiographic characteristics of the treated tumor are by no means definitive in establishing a diagnosis of control versus failure. Thus, practitioners should be mindful that, because of this initial 18-24 month grace period in which increases in tumor volume may indicate either postirradiation tumor necrosis and edema or definitive tumor growth, definitively stating that radiation therapy has been successful in tumor control for the first two years following treatment is not possible. Acoustic neuroma tumor growth is controlled by radiotherapy via 2 main mechanisms, direct cellular injury and vascular fibrosis. In the higher-dose central region, tumor histopathology has revealed necrosis, decreased tumor cell population, and fibrosis. In the lower-dose peripheral region, vascular occlusion, macrophage infiltration, fibrin deposits, and thrombus formation have been identified. In general, apoptosis is the mechanism of cellular death and direct tumor control. Reports by Perez indicated a close relationship between the dose of radiation given and the probability of tumor control. The effects of radiation on most healthy tissues, including the interrelationship of total dose, fractions used, volume and function of the organ irradiated, and mechanisms of cellular repair, have been well documented. Although a number of studies have reported the radiation tolerance of healthy tissues, the data preceded 3-dimensional planning and fractionated treatments and thus must be viewed cautiously. Accuracy in radiation dose delivery can be correlated with a higher probability of tumor control, but because of the extreme proximity of many important structures within the skull base, imprecise systems, frameshift errors, treatment prescription error, or other treatment volume errors can lead to increased rates of complications. In one of the earliest large-scale reports, from 1993, Norén et al reported 254 patients (193 of whom had a unilateral tumor) who underwent single-dose gamma knife radiation at Karolinska Institute. In the unilateral cases, 55% of tumors shrank, 33% were unchanged, and 12% continued to enlarge at least temporarily. Those that enlarged did so over 6-18 months posttreatment and then either shrank or stabilized. This study indicated a tumor control rate of 94% at one year. The group reported a 15% prevalence of facial palsy and a 33% prevalence of hearing preservation. Miller and colleagues reported their findings in a prospective study of 82 patients with acoustic neuroma in 1999. The first 42 patients were treated in a high-dose single-treatment protocol, and the next 40 were treated with a reduced-dose protocol. The researchers found that a tumor margin dose of 18 Gy or greater is the most significant risk factor for facial and trigeminal nerve complications. Tumor margin doses of 16 Gy or less pose a significantly lower risk of permanent facial palsy. Interestingly, 2 of the patients undergoing a higher-dose protocol continued to progress and required microsurgical decompression. Litvack and colleagues reported their series of 134 acoustic neuroma patients treated with gamma knife in 2003. Mean follow-up was 32 months. Patients were treated with a mean marginal dose of 12 Gy. Tumor control rate was reported at 97%, and the authors explicitly defined control as no change or reduction in tumor size at last imaging. Hearing preservation rate was 62%, and facial paralysis occurred in 2.2% of patients, all 3 of whom had only a temporary paralysis. Chung and colleagues reported outcomes from their cohort of 195 patients treated for acoustic neuroma. With a mean follow-up up of 31 months, 94% demonstrated no growth or decrease in tumor size. Their study is notable for a report of 5 patients who had latent "uncontrolled tumor swelling", 3 of whom were as late as 24, 33, and 62 months postirradiation. Patients were evaluated using serial imaging tests, clinical evaluations, and a survey 5-10 years postprocedure. The average dose of radiation to the tumor margin was 16 Gy at a 50% isodose line, and the mean transverse diameter of the tumor was 22 mm (range, 8-39 mm). Resection had been performed previously in 42 patients (26%); in 13 patients, the tumor represented a recurrence of disease after a previous total resection. The rate of tumor control (with no resection required) was 98%. Of the tumors, 100 (62%) became smaller, 53 (32.5%) remained unchanged in size, and 9 (5.5%) became slightly larger. Salvage resection was performed in 4 patients (2.5%) within 4 years of gamma knife radiation. These authors reported hearing loss in 49% of patients, facial palsy in 21%, and trigeminal nerve problems in 27%. Of patients working at the time of treatment, 31% were no longer working after treatment. No new neurologic deficits occurred later than 28 months after treatment. Of patients in whom stereotactic radiation was the primary treatment, 95% believed it was successful. At least 1 complication was described by 36 of 115 patients (31%); 56% of complications resolved. Some of the criticisms of the report by Kondziolka et al include failure to analyze age as a variable, a lack of detail regarding tumor size and preoperative growth rates, inclusion of previously operated tumors in the study group (which underreports the frequency of facial palsy and hearing loss because they were preexisting), actual evaluation of just 38 patients 7-8 years after treatment, failure to use a validated instrument to determine health status, use of a change in size of 2 mm as a measure of outcome, and failure to mention the risk of secondary cancer after treatment. Many of these criticisms have been addressed in the literature. As a result of the high rates of facial nerve paralysis and trigeminal neuralgia from the Kondziolka study, this group examined outcomes of patients treated at a lower tumor margin dose. Flickinger et al reported in 2001 a retrospective series of 190 acoustic neuroma patients treated with a mean tumor marginal dose of 13 Gy at the 50% isodose line. At this lower peripheral isodose, tumor control remained good at 97%, while complications of radiation were significantly reduced: rates of facial nerve dysfunction and trigeminal neuralgia at a mean follow-up period of 5 years were 1.1% and 2.6%, respectively. "Hearing levels" were preserved in 71%, while "testable speech discrimination" was present in 91%. Of significant note, no incidence of facial nerve dysfunction was found in patients with peripheral isodoses of more than 15 Gy at the 50% isodose line, while hearing levels were actually improved in 7% of patients. In 2005, Lunsford et al summarizes outcomes for 829 patients treated between 1989 and 2002 with a mean follow up of 10 years. Marginal dose remained 13 Gy with a mean tumor volume of 2.5 mL. With this treatment protocol, tumor control rate remained 97% during that period (recorded as "no additional treatment needed"), while hearing level, again graded with the Gardner-Robertson scale, was preserved in 50%. Facial nerve dysfunction occurred in 1% of patients, while trigeminal dysesthesia was found in 3%. As a comparison, Hasegawa and colleagues in Japan reported outcomes on a similarly large cohort of patients with significantly long follow-up. Their group followed 317 patients treated with a marginal dose of 13 Gy at the 50% isodose line, with a mean follow-up period of 7.8 years. Hearing preservation was 68% in those treated with marginal doses of 13 Gy or less at the 50% isodose line, while it was only 13% in those receiving greater than 13 Gy at the tumor margin. They found 91% of their patients demonstrated tumor control, defined as stable or smaller tumor volume at last imaging. Of note, only 2 patients had complete remission of tumor volume. Of the 26 that failed, 4 died of tumor progression or radiation-induced edema and intracerebral complications, 6 underwent second gamma knife treatment (3 of whom later required craniotomy), and 21 developed hydrocephalus requiring ventriculoperitoneal shunting. In addition, one patient had malignant transformation at 51 months and succumbed to progression of malignant acoustic tumor. A follow-up study by the Hasegawa group reported on 71 patients with a mean follow-up of 135 months. In this group, 62 had stable or smaller tumor volumes, while 9 had progression of tumor or uncontrolled tumor edema causing intracranial complications and requiring craniotomy and resection. The question of whether gamma knife radiotherapy could be an acceptable alternative to microsurgery in patients with larger vestibular schwannomas has continued to be examined in recent years. Pitts and Jackler and Yamamoto et al also noted that 50-60% of patients demonstrate either no growth or slow growth before treatment, and therefore no or slow growth after treatment does not necessarily represent control. [22, 23] The authors have performed salvage microsurgery on 1 patient following single-dose stereotactic radiation. In this previously unreported case, a large cyst developed more than 1 year after treatment. This cyst protruded from the wall of the tumor and compressed the brain stem. Histopathology of the tumor showed no specific effect from the radiation. Clearly, longer follow-up study is needed to be certain that unchanged size indeed represents long-term control. Because the brain has serial architecture, damage to even a small area could have significant repercussions. Werner-Wasik et al found that one third of patients undergoing stereotactic radiation had an immediate posttreatment adverse effect, including nausea, headache, and dizziness. Rarely, acute swelling of the tumor occurs, necessitating supportive therapies such as ventriculoperitoneal shunting, steroid administration, and seizure control. Dizziness and vertigo occurred in 4 of 12 patients with acoustic neuroma, and this complication did not appear to be related to dose or technique. Flickinger et al reported that the acoustic nerve was the most sensitive cranial nerve to radiation doses of 12-16 Gy, while the facial nerve was the least sensitive. Finally, most reports indicate that serviceable hearing is preserved in 60-65% of patients with single-dose protocols. 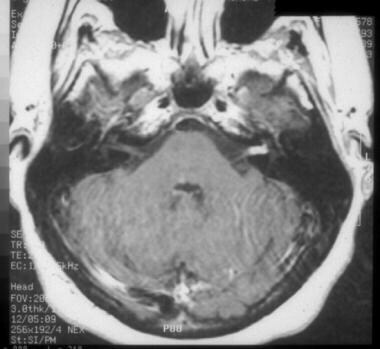 Fractionated stereotactic radiation for acoustic tumors developed in part because of the relatively high incidence of trigeminal and facial nerve palsies that occurred after treatment with single-dose stereotactic radiation and in part as an extension of traditional fractionated radiotherapy regimens onto which stereotaxy was applied. Consequently, a broad range of fractionated stereotactic therapy protocols exist, from hypofractionated protocols of as little as 3 sessions with a total marginal tumor dose of as little as 18 Gy, to standard 30-fraction regimens over 6 weeks of 1.8-2 Gy fractions totaling up to 50-60 Gy. Most published studies involve retrospective reviews of patients treated within a given Radiation Treatment Center’s practice, and outcomes from most of such studies are in consistent agreement both with other fractionated protocols as well as with other single dose gamma knife protocols. Lederman and colleagues reported in 1997 no permanent facial or trigeminal nerve problems in 39 acoustic tumors managed with 20 Gy given in weekly fractions of 4-5 Gy. Among smaller tumors (< 3 cm), 61% shrank in size, and the remaining 39% showed no growth over 27 months. Among larger tumors (>3 cm), 81% shrank in size, and the remainder showed no further growth. Only 1 patient had a transient facial palsy. These authors concluded that fractionated stereotactic radiation offers high control rates while avoiding the morbidity frequently observed after single-dose stereotactic radiation or microsurgery. Song and Williams in 1999 reported similar data managing 31 acoustic tumors using a total dose of 25 Gy given in 5 consecutive daily fractions of 5 Gy. The tumor shrank in 29% of patients and was unchanged in 71%. No facial palsies developed, but 2 patients developed trigeminal neuropathy. Balance improved in 3 patients, was unchanged in 20, and was markedly worse in 7 patients. Of the 12 patients with serviceable hearing before treatment, 9 (75%) retained useful hearing after therapy. Of 25 patients with any hearing before treatment, 2 improved, 10 were unchanged, and 13 were worse. Although this protocol may provide good control of the acoustic neuroma, it has a much greater incidence of cranial nerve dysfunction than the protocol of Lederman et al. Poen and colleagues in 1999 reported results in 33 patients receiving 21 Gy in 3 fractions over 24 hours. Tumor control was documented over 2 years in 97% of patients. The single patient with tumor progression remains asymptomatic and does not require surgery. With this protocol, 16% of patients developed trigeminal neuropathy, and 3% developed mild facial palsy. All patients with serviceable hearing maintained it after therapy. Sawamura and colleagues reported results from 100 patients treated with a protocol of 40-50 Gy total radiation administered in 20-25 fractions over 5-6 weeks. Median follow-up was 45 months. In this group, 91% had no growth more than 2 mm or no requirement for salvage surgery. Hearing preservation to within Gardner-Robertson class I or II was 71%. A 4% rate of transient facial paralysis, 14% rate of trigeminal neuralgia, and 17% rate of balance disturbance were found. Chang and colleagues in 2005 reported the first large scale experience with the CyberKnife LINAC unit. Their cohort consisted of 61 patients followed for a mean of 48 months, treated with a total dose of 18-21 Gy at the tumor margin over 3 fractions of 6-7 Gy each. Within this group, 48% of tumors decreased in size, 50% were stable, and 2% progressed. Transient facial twitching was noted in 2 patients, and none had trigeminal dysesthesia. Serviceable hearing was preserved in 74%. The report of Carlson et al in 2013 coincided with a systematic review in 2010 by Yang et al. This review of the literature evaluated hearing preservation following stereotactic radiotherapy for vestibular schwannomas. In the study, 4234 patients were followed with a mean follow up of 44.4 months. Overall, 51% of patients had serviceable hearing at follow up. Dose-dependent subgroup analysis showed that 60.5% of patients had serviceable hearing if the dose was less than 13, whereas 50.4% had serviceable hearing in those receiving greater than 13 Gy. Chan and colleagues reported 70 patients treated with conformal (but not highly conformal) fractionated stereotactic radiotherapy, treated with a median dose of 54 Gy at the 95% isodose line, over 30 fractions. Of the group, 8% required salvage resection by 5 years. Facial nerve paralysis occurred in 1%, while trigeminal neuralgia occurred in 3% at 3 years. Combs et al reported their series of 106 acoustic neuroma patients treated between 1989 and 2004, with a median follow up of 48 months. With a median total dose of 57.6 Gy over 30 fractions, local tumor control was quoted at 93% at 5 years, with hearing preservation in 94% at 5 years, facial paralysis in 2%, and trigeminal neuralgia in 3%. Koh and colleagues in Toronto reported 60 patients treated with mean 50 Gy over 25 fractions. The 5-year actuarial control was 96%, while hearing preservation was 77% and facial paralysis in 5%. However, one patient developed and died from glioblastoma multiforme nearly 6 years following radiotherapy. Traditionally, fractionated therapy has been considered to be associated with fewer cranial nerve complications than single-dose treatment. Furthermore, early reports suggested that the use of multiple smaller-dose fractions over a longer period perhaps gives the greatest possibility of hearing preservation, avoidance of facial palsy, and tumor control. However, use of multiple-dose fractionated radiation therapy results in potentially larger areas receiving multiple low doses of radiation (including adjacent neural and vascular structures), thus offsetting any radiobiological advantage of fractionation. From the latest larger studies of fractionated stereotactic radiotherapy, no distinct advantage to either traditionally fractionated, hypofractionated, or non-fractionated techniques, appears with regards to tumor control, posttreatment cranial neuropathy, or other postirradiation complications. Fractionated stereotactic radiotherapy does seem to confer a slight advantage towards hearing preservation compared to non-fractionated modalities. As the body of literature regarding treatment outcomes in both single dose and fractionated stereotactic radiotherapy techniques continues to grow, the general outcomes of patients appear to be comparable between stereotactic radiotherapy and microsurgery. Several real and potentially large confounding factors limit this interpretation, however. First, the definition of “tumor control” is not clearly or uniformly defined in many studies. Although several studies do explicitly state a limitation in tumor growth and size within a defined period as their definition of tumor control, others describe “no additional treatment needed” or “no salvage surgery required” as their definition of control. Worse still are studies that make no mention whatsoever of their criteria for tumor control. In either case, interpretation of tumor control is difficult and possibly not equivalent to definitions of tumor control published in the microsurgical literature. Secondly, as stated earlier, when tumor control is actually defined as no growth, this definition in and of itself may be incorrect and misleading. Because of the definite likelihood of stability in tumor size even without treatment (up to 60%), a large number of tumors that are initially irradiated without secondary scans demonstrating definitive growth can be counted as treatment successes but in fact may actually overestimate the true rate of tumor control. These 2 factors significantly limit the degree to which some radiotherapy studies can be interpreted. Thirdly, surgical salvage following failed irradiation places the patient at significantly greater risk of incomplete tumor resection, prolonged operative times, higher rates of postoperative complications such as facial nerve paralysis, hearing loss (in attempted hearing conservation procedures), and CSF leak, and overall poorer outcomes than in those patients not previously irradiated. Finally, a small but definite risk of malignant transformation of tumor and or secondary malignancy from irradiation exists. Eight case reports of malignant transformation of acoustic neuroma can be found: 2 followed external beam radiotherapy, 2 followed stereotactic radiotherapy, and only 4 were spontaneous. Although lacking statistical power, this comparison clearly highlights the greater risk of malignant transformation of acoustic neuromas following irradiation. Balasubramaniam and colleagues reviewed all reported cases of secondary neoplasms following stereotactic radiotherapy. Including their institution’s one case, as of 2007 20 cases of secondary tumors associated with prior stereotactic radiotherapy were reported. Of these, 10 were de novo tumors, 8 of which were malignant. Accelerated growth of primary benign acoustic neuromas and subsequent resection with histopathological confirmation of malignant transformation was found in 6 patients, all of whom had NF-2. Although extremely low, the risk of malignant transformation and/or de novo secondary malignancy must be discussed with patients, particularly NF-2 patients and those with high neoplastic potential. Comparing stereotactic radiation with microsurgery, studies show substantially less cost for radiation treatment of acoustic tumors smaller than 3 cm in diameter and comparable results in terms of postoperative outcomes, as of mean follow-up periods on the order of 5-10 years for most gamma knife studies and 3-4 years for LINAC based fractionated treatment studies. Stereotactic radiation is a reasonable method to manage some acoustic neuromas, but patients must be willing to undergo careful follow-up care, including MRI scans, over a long period. Because of the lower risks of treatment complications over microsurgery in the acute setting, stereotactic radiotherapy is advantageous as a treatment modality in patients who are older, medically infirm, requiring anticoagulant therapy, or otherwise poorer surgical or anesthetic candidates. Stereotactic radiotherapy also displays an advantage over microsurgery in the setting of treatment of only-hearing ears, for similar arguments. The advantages of stereotactic radiotherapy, whether fractionated, hypofractionated, or single-dose, in the acute setting are offset by the long-term rates of cranial neuropathy and hearing loss eventually prevalent, which are comparable to those seen following microsurgery. Transient tumor expansion following stereotactic radiotherapy has been recognized as a common consequence, and a recent study looked at the effect of tumor expansion on symptomatic outcomes. Aoyama and colleagues looked at 201 patients who were treated with a linear accelerator–based stereotactic radiotherapy system. Two Gy per fraction was used for the majority of patients, to total doses of 50 Gy (71%), 46 Gy (11%), 46 Gy (8%), and 30-44 Gy (6 patients). The median follow up was 72 months. The maximum diameter was 9 mm or less in 13 patients, 10-19 mm in 79 patients, 20-29 mm in 87 patients, and 30 mm or greater in 22 patients. Furthermore, because brainstem compression by acoustic tumor is not improved by radiation, surgery is the preferred option for such patients with brainstem compressive or hydrocephalic tumors. Finally, the condition of patients with significant dysequilibrium or recurrent vertigo is not improved and may actually worsen by stereotactic radiation. Patients who are poor candidates for stereotactic radiation should still be informed of the availability of the therapy and be told why they are poor candidates, in the context of the relative risks and benefits of radiotherapy as opposed to microsurgery. In summary, patients who have serviceable hearing, no vertigo, and a non-brainstem-compressive or non-hydrocephalic acoustic tumor 2 cm in diameter or smaller are good candidates for stereotactic radiotherapy. In addition, more recent studies may indicate that tumors larger than 2.5 cm may also respond well to radiotherapy. Patients should be counseled and should clearly understand that while stereotactic radiotherapy minimizes acute risk in tumor treatment such as those associated with craniotomy and microsurgery procedures, their exposure to radiation puts them at higher risk of subacute, long-term, or latent complications that microsurgery and definitive resection avoid. International RadioSurgery Association (IRSA). Stereotactic radiosurgery for patients with vestibular schwannomas. Harrisburg PA: International RadioSurgery Association (IRSA); 2006 May. 16 (Radiosurgery practice guideline report; no. 4-06). [Full Text]. Boari N, Bailo M, Gagliardi F, et al. Gamma Knife radiosurgery for vestibular schwannoma: clinical results at long-term follow-up in a series of 379 patients. J Neurosurg. 2014 Dec. 121 Suppl:123-42. [Medline]. Norén G, Greitz D, Hirsch A, Lax I. Gamma knife surgery in acoustic tumours. Acta Neurochir Suppl (Wien). 1993. 58:104-7. [Medline]. Miller RC, Foote RL, Coffey RJ, et al. Decrease in cranial nerve complications after radiosurgery for acoustic neuromas: a prospective study of dose and volume. Int J Radiat Oncol Biol Phys. 1999 Jan 15. 43(2):305-11. [Medline]. Flickinger JC, Kondziolka D, Lunsford LD. Dose and diameter relationships for facial, trigeminal, and acoustic neuropathies following acoustic neuroma radiosurgery. Radiother Oncol. 1996 Dec. 41(3):215-9. [Medline]. Litvack ZN, Noren G, Chougule PB, Zheng Z. Preservation of functional hearing after gamma knife surgery for vestibular schwannoma. Neurosurg Focus. 2003 May 15. 14(5):e3. [Medline]. Paek SH, Chung HT, Jeong SS, et al. Hearing preservation after gamma knife stereotactic radiosurgery of vestibular schwannoma. Cancer. 2005 Aug 1. 104(3):580-90. [Medline]. Bush ML, Shinn JB, Young AB, Jones RO. Long-term hearing results in gamma knife radiosurgery for acoustic neuromas. Laryngoscope. 2008 Jun. 118(6):1019-22. [Medline]. Chang SD, Gibbs IC, Sakamoto GT, Lee E, Oyelese A, Adler JR Jr. Staged stereotactic irradiation for acoustic neuroma. Neurosurgery. 2005 Jun. 56(6):1254-61; discussion 1261-3. [Medline]. Murphy ES, Barnett GH, Vogelbaum MA, Neyman G, Stevens GH, Cohen BH. Long-term outcomes of Gamma Knife radiosurgery in patients with vestibular schwannomas. J Neurosurg. 2011 Feb. 114(2):432-40. [Medline]. Kondziolka D, Lunsford LD, McLaughlin MR, Flickinger JC. Long-term outcomes after radiosurgery for acoustic neuromas. N Engl J Med. 1998 Nov 12. 339(20):1426-33. [Medline]. Flickinger JC, Kondziolka D, Niranjan A, Lunsford LD. Results of acoustic neuroma radiosurgery: an analysis of 5 years' experience using current methods. J Neurosurg. 2001 Jan. 94(1):1-6. [Medline]. Niranjan A, Lunsford LD, Flickinger JC, Maitz A, Kondziolka D. Can hearing improve after acoustic tumor radiosurgery?. Neurosurg Clin N Am. 1999 Apr. 10(2):305-15. [Medline]. Lunsford LD, Niranjan A, Flickinger JC, Maitz A, Kondziolka D. Radiosurgery of vestibular schwannomas: summary of experience in 829 cases. J Neurosurg. 2005 Jan. 102 Suppl:195-9. [Medline]. Hasegawa T, Fujitani S, Katsumata S, Kida Y, Yoshimoto M, Koike J. Stereotactic radiosurgery for vestibular schwannomas: analysis of 317 patients followed more than 5 years. Neurosurgery. 2005 Aug. 57(2):257-65; discussion 257-65. [Medline]. Hasegawa T, Kida Y, Kobayashi T, Yoshimoto M, Mori Y, Yoshida J. Long-term outcomes in patients with vestibular schwannomas treated using gamma knife surgery: 10-year follow up. J Neurosurg. 2005 Jan. 102(1):10-6. [Medline]. Hasegawa T, Kida Y, Kato T, Iizuka H, Yamamoto T. Factors associated with hearing preservation after Gamma Knife surgery for vestibular schwannomas in patients who retain serviceable hearing. J Neurosurg. 2011 Dec. 115(6):1078-86. [Medline]. Milligan BD, Pollock BE, Foote RL, Link MJ. Long-term tumor control and cranial nerve outcomes following ? knife surgery for larger-volume vestibular schwannomas. J Neurosurg. 2012 Mar. 116(3):598-604. [Medline]. Yang HC, Kano H, Awan NR, Lunsford LD, Niranjan A, Flickinger JC. Gamma Knife radiosurgery for larger-volume vestibular schwannomas. Clinical article. J Neurosurg. 2011 Mar. 114(3):801-7. [Medline]. Iwai Y, Ishibashi K, Watanabe Y, Uemura G, Yamanaka K. Functional Preservation After Planned Partial Resection Followed by Gamma Knife Radiosurgery for Large Vestibular Schwannomas. World Neurosurg. 2015 Mar 16. [Medline]. Wiet RJ, Zappia JJ, Hecht CS, O'Connor CA. Conservative management of patients with small acoustic tumors. Laryngoscope. 1995 Aug. 105(8 Pt 1):795-800. [Medline]. Pitts LH, Jackler RK. Treatment of acoustic neuromas. N Engl J Med. 1998 Nov 12. 339(20):1471-3. [Medline]. Yamamoto M, Jimbo M, Ide M, et al. Is unchanged tumor volume after radiosurgery a measure of outcome?. Stereotact Funct Neurosurg. 1996. 66 Suppl 1:231-9. [Medline]. Werner-Wasik M, Rudoler S, Preston PE, et al. Immediate side effects of stereotactic radiotherapy and radiosurgery. Int J Radiat Oncol Biol Phys. 1999 Jan 15. 43(2):299-304. [Medline]. Lederman G, Lowry J, Wertheim S, et al. Acoustic neuroma: potential benefits of fractionated stereotactic radiosurgery. Stereotact Funct Neurosurg. 1997. 69(1-4 Pt 2):175-82. [Medline]. Song DY, Williams JA. Fractionated stereotactic radiosurgery for treatment of acoustic neuromas. Stereotact Funct Neurosurg. 1999. 73(1-4):45-9. [Medline]. Poen JC, Golby AJ, Forster KM, et al. Fractionated stereotactic radiosurgery and preservation of hearing in patients with vestibular schwannoma: a preliminary report. Neurosurgery. 1999 Dec. 45(6):1299-305; discussion 1305-7. [Medline]. Kapoor S, Batra S, Carson K, Shuck J, Kharkar S, Gandhi R. Long-term outcomes of vestibular schwannomas treated with fractionated stereotactic radiotherapy: an institutional experience. Int J Radiat Oncol Biol Phys. 2011 Nov 1. 81(3):647-53. [Medline]. Sawamura Y, Shirato H, Sakamoto T, et al. Management of vestibular schwannoma by fractionated stereotactic radiotherapy and associated cerebrospinal fluid malabsorption. J Neurosurg. 2003 Oct. 99(4):685-92. [Medline]. Morimoto M, Yoshioka Y, Kotsuma T, Adachi K, Shiomi H, Suzuki O. Hypofractionated stereotactic radiation therapy in three to five fractions for vestibular schwannoma. Jpn J Clin Oncol. 2013 Aug. 43(8):805-12. [Medline]. Mahboubi H, Sahyouni R, Moshtaghi O, et al. CyberKnife for Treatment of Vestibular Schwannoma: A Meta-analysis. Otolaryngol Head Neck Surg. 2017 Jul. 157 (1):7-15. [Medline]. Carlson ML, Jacob JT, Pollock BE, Neff BA, Tombers NM, Driscoll CL. Long-term hearing outcomes following stereotactic radiosurgery for vestibular schwannoma: patterns of hearing loss and variables influencing audiometric decline. J Neurosurg. 2013 Mar. 118(3):579-87. [Medline]. Yang I, Sughrue ME, Han SJ, Aranda D, Pitts LH, Cheung SW. A comprehensive analysis of hearing preservation after radiosurgery for vestibular schwannoma. J Neurosurg. 2010 Apr. 112(4):851-9. [Medline]. Chan AW, Black P, Ojemann RG, et al. Stereotactic radiotherapy for vestibular schwannomas: favorable outcome with minimal toxicity. Neurosurgery. 2005 Jul. 57(1):60-70; discussion 60-70. [Medline]. Combs SE, Volk S, Schulz-Ertner D, Huber PE, Thilmann C, Debus J. Management of acoustic neuromas with fractionated stereotactic radiotherapy (FSRT): long-term results in 106 patients treated in a single institution. Int J Radiat Oncol Biol Phys. 2005 Sep 1. 63(1):75-81. [Medline]. Koh ES, Millar BA, Menard C, et al. Fractionated stereotactic radiotherapy for acoustic neuroma: single-institution experience at The Princess Margaret Hospital. Cancer. 2007 Mar 15. 109(6):1203-10. [Medline]. Rasmussen R, Claesson M, Stangerup SE, Roed H, Christensen IJ, Caye-Thomasen P. Fractionated stereotactic radiotherapy of vestibular schwannomas accelerates hearing loss. Int J Radiat Oncol Biol Phys. 2012 Aug 1. 83(5):e607-11. [Medline]. Powell C, Micallef C, Gonsalves A, Wharram B, Ashley S, Brada M. Fractionated stereotactic radiotherapy in the treatment of vestibular schwannoma (acoustic neuroma): predicting the risk of hydrocephalus. Int J Radiat Oncol Biol Phys. 2011 Jul 15. 80(4):1143-50. [Medline]. Balasubramaniam A, Shannon P, Hodaie M, Laperriere N, Michaels H, Guha A. Glioblastoma multiforme after stereotactic radiotherapy for acoustic neuroma: case report and review of the literature. Neuro Oncol. 2007 Oct. 9(4):447-53. [Medline]. [Full Text]. Aoyama H, Onodera S, Takeichi N, Onimaru R, Terasaka S, Sawamura Y. Symptomatic outcomes in relation to tumor expansion after fractionated stereotactic radiation therapy for vestibular schwannomas: single-institutional long-term experience. Int J Radiat Oncol Biol Phys. 2013 Feb 1. 85(2):329-34. [Medline]. Berkowitz O, Han YY, Talbott EO, et al. Gamma Knife Radiosurgery for Vestibular Schwannomas and Quality of Life Evaluation. Stereotact Funct Neurosurg. 2017. 95 (3):166-73. [Medline]. Chung WY, Liu KD, Shiau CY, et al. Gamma knife surgery for vestibular schwannoma: 10-year experience of 195 cases. J Neurosurg. 2005 Jan. 102 Suppl:87-96. [Medline]. Driscoll CLW. Vestibular schwannoma (acoustic neuroma). Jackler RK, Driscoll CLW, eds. Tumors of the Ear and Temporal Bone. New York: Lippincott Williams and Wilkins; 2000. 172-218. Friedman RA, Brackmann DE, Hitselberger WE, Schwartz MS, Iqbal Z, Berliner KI. Surgical salvage after failed irradiation for vestibular schwannoma. Laryngoscope. 2005 Oct. 115(10):1827-32. [Medline]. Limb CJ, Long DM, Niparko JK. Acoustic neuromas after failed radiation therapy: challenges of surgical salvage. Laryngoscope. 2005 Jan. 115(1):93-8. [Medline]. Thomas C, Di Maio S, Ma R, et al. Hearing preservation following fractionated stereotactic radiotherapy for vestibular schwannomas: prognostic implications of cochlear dose. J Neurosurg. 2007 Nov. 107(5):917-26. [Medline]. van Eck AT, Horstmann GA. Increased preservation of functional hearing after gamma knife surgery for vestibular schwannoma. J Neurosurg. 2005 Jan. 102 Suppl:204-6. [Medline]. The authors and editors of Medscape Reference gratefully acknowledge the contributions of previous author Mitchell K Schwaber, MD, to the development and writing of this article.